It’s Halloween Eve, also known as Devil’s Night. As a big fan of the city of Detroit, I was disheartened to learn that this term is primarily associated with major vandalism and arson in the Motor City. I’m hoping that Detroit is peaceful tonight, for many reasons. Anyway…it’s also National Bat Week, and I dig bats. 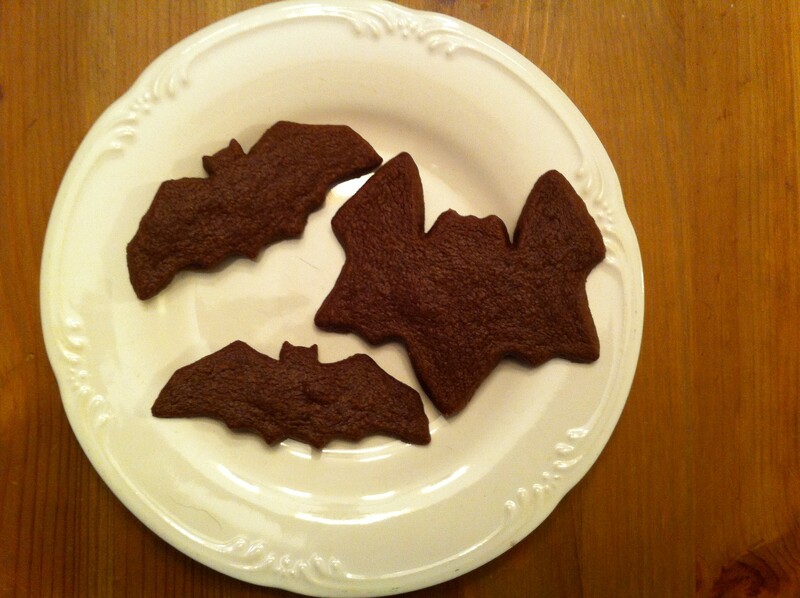 I’ve been wanting to make bat-themed sugar cookies for a while, and I found this very easy recipe on Betty Crocker’s website. As usual, Betty knows her stuff. This dough is incredibly easy to work with, not too soft and not too firm, just the right texture for rolling and cutting. I usually don’t enjoy making sugar cookies because they’re quite labor-intensive, but this recipe was really simple. I used two different bat cutters and intended to pipe on some icing eyes and fangs, but once these treats were done I decided I liked them better just as they were. Happy Halloween! In a medium bowl, combine flour, cocoa powder, and salt; set aside. In a mixing bowl, cream together butter and sugar until fluffy. Add egg and vanilla extract, beating until well-combined. Slowly add flour mixture, scraping the sides of the bowl often and beating until a very well-combined, soft dough forms. Gently knead the dough a few times to make sure it comes together; roll dough into a ball and flatten into a disc. Wrap in plastic and chill for 1 hour. Preheat oven to 375 degrees; line three baking sheets with parchment or foil. On a lightly floured surface, roll dough to 1/8 inch thickness. Cut with a bat-shaped cookie cutter; if using different shapes, be sure to bake the same shape on one cookie sheet. Baking different-sized or differently-shaped cookies on the same sheet can lead to uneven results; some of your cookies might be underdone while others will be overdone. Bake for 8-10 minutes, until edges are set. Remove from oven and cool on cookie sheets for 1-2 minutes, then remove to wire racks to cool completely.